Since 2003, experimentation on great apes (chimpanzees, pygmy chimpanzees, gorillas, orangutans) and nine species of Gibbons have been banned in Sweden, but it is still permitted to use other primates for animal testing. In Sweden, primates are used for vivisection experiments at the Institute for Infectious Disease Control (SMI) in Solna. The primates used are macaques that are imported from breeding facilities in China and Israel. Even though it is illegal to purchase primates caught in the wild, SMI has been found to have purchased wild apes on several occasions. Currently there are about 50 primates locked away at SMI. These primates have never had the right to decide over their own lives. Though they have been raised in captivity, they still have the desire and the need to follow their natural instincts. At SMI this is impossible. It is therefore not uncommon that the primates develop stereotypical behavior or injury both themselves and one another. The Animal Rights Alliance has read several reports of primates that have died during experiments because of injuries that they had received as a result of their living conditions. Some primates have even died during transport before ever arriving at SMI. The Animal Rights Alliance has started the campaign – Stop the Primate Experiments – to spread information, raise public opinion and get a ban passed on the use of primates in animal testing, both in Sweden and in the EU. We are not alone in our views, there is a growing opposition against all sorts of animal testing, especially that which involves the use of primates. Now is the time to gather together as one voice - to demand a stop to the torture of the primates at SMI. Help us to give these primates the right to decide over their own lives. Sign our petition, get in touch with both politicians and those responsible at SMI, write letters to the editor in your local paper, partake in public demonstrations and donate, or better yet, become a supporting member of the campaign. But above all, let your voice be heard and demand a ban on all primate testing! For decades, SMI has been the subject of criticism in regards to their treatment of primates used for animal testing. The primates are kept in cages, no bigger than a closet, in a basement without any windows. Despite protests from the public, and the fact that the Swedish Department of Agriculture has demanded the decommissioning of the facility, the Swedish Government subsidized the building of a new primate housing unit, that mirrored the conditions of the old laboratory. The building was completed in 2003 and was strongly criticized by the Department of Agriculture’s primate group, who stated the new primate center “does not represent a modern primate center, built with consideration for the welfare of animals”. SMIs experimentation on primates is very controversial. 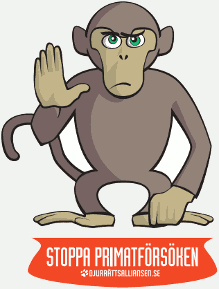 In the year 2000, Aftonbladet (the biggest evening newspaper in Sweden) carried the following headlines: “SMI banned from keeping primates” and “the animal cruelty has ended”. The background to this press attention was that SMI, since 1994, has not been abiding by rules and regulations stipulated in the Animal Cruelty Act. Furthermore, SMI had lied to the Department of Agriculture in regards to the size of the cages that housed the primates. The Department of Agriculture even went so far as to “question SMI:s competency in conducting any type of animal testing whatsoever”. The greater majority of apes at SMI live in two meter high cages, about as small as three normal-sized closets. They are housed in pairs or in a group. A small number of individuals also have the possibility of getting some fresh air by being temporarily placed in an outdoor cage, but this cage is only available to primates being used for certain experiments. One demand made by the Department of Agriculture, which would allow SMI to keep its permits to experiment on animals, was the daily training of primates for “cooperation” in the taking of test samples. To better facilitate the capture of the primates for anesthesia and test sampling, the primates are trained to “cooperate” using so-called “clickers” (the purpose is to train the primate to volunteer their own arm to be pricked with a needle in exchange for a reward). But SMI continues to capture primates with the help of a movable wall at the back of each cage that presses the primate up against the cage bars, restricting their movements. SMI admits to not abiding by the demands of the Department of Agriculture. EUPRIM-Net is a network of 8 European animal testing facilities that use primates and SMI is one of those facilities. The idea is that together, the 8 build a virtual primate center for the experimentation and breeding of primates. Several other laboratories that use primates for animal experimentation, among them Törneby that previously existed in Sweden, have allowed older primates, no longer needed in experiments, to live out their lives at the facility; partly because it is unnecessary to kill healthy animals and partly because it is well-established that older animals help create social stability for other primates at the facility. Many have made an effort to rehabilitate primates from non-deadly experiments and allowed them to move to wildlife parks and reserves. At SMI, that way of thinking does not exist, even though not all of SMIs experiments are deadly. Many of SMIs primates could be given a new life if SMI utilized the myriad of professional wildlife rehabilitators who have expressed an interest in taking care of and rehabilitating primates from SMI. SMI is not interested that any primates survive and testify to the brutality that occurs behind their locked doors. The only way that primates leave SMI is through death and few primates ever reach the age of 8 at SMI; most primates are killed at the age of 5. Where do all of the primates come from? For a long time, SMI has had the ambition to manage their own breeding of primates for animal testing but have not had the economic resources to do so. The primates at SMI are instead imported from breeding facilities in China, Mauritius, Indonesia, the Philippines and Israel, but SMI have even been discovered purchasing primates caught in the wild for their experiments. Since 1988, around 4,500 primates have been imported to Sweden for use in animal experimentation, the majority of them arriving at SMI. The breeding facility that SMI relies on for most of its primate purchases is Guang Xi Handsome Apes and Monkeys Experiment Farming Development co. Ltd. in China. The facility breeds up to 10,000 primates a year, half of which are exported to laboratories in Europe and the USA. China is a country that does not have any laws against animal cruelty. The animals are completely defenseless and there is no government oversight into animal breeding operations. In 1992, the British anti-vivisection organization, BUAV, exposed that a large percentage of primates exported to Europe and the USA were ill-treated and up to 70 percent died before ever arriving at their destination. Both Mauritius and Southeast Asia were pointed out as areas where the substandard treatment of animals led to many primates dying before ever reaching Western laboratories. According to the Swedish Animal Cruelty Act, primates and other animals caught in the wild may not be used for animal experimentation. Only primates bred specifically for vivisection can be used for the conducting of animal experiments. In one of the Bills of Health accompanying 32 Chinese primates imported to SMI, the primates are described as “Wild Primates”. The Chinese veterinarian Li Xiaohang has however, in a separate Bill, described the primates as bred from a primate facility. When speaking to the Swedish evening paper Expressen, a representative for SMI admitted that SMI cannot guarantee that the primates are not caught in the wild. At the breeding facility in China, female primates are grouped together with one male. Their young are removed from the social group when they are 8-12 months old (in the wild, they are breastfed for 14 months and have close contact with their mother for several years). The young are placed in a large group of up to 20 individuals and when they are 3-4 years old, they are sold to the laboratories. The conditions of the cages that the primates are forced to live in are reprehensible. Small cages with cold floors and walls of metal and concrete. There is nothing to stimulate them in the cages. The only time that the primates have any contact with human beings is when they are captured and different tests performed on them. In those cases, they are often isolated for up to 30 days. This is incredibly stressful for primates who are not used to human contact. The transportation of primates is long and in many cases traumatizing. From breeding facilities in China, the trip to quarantine in Holland takes about 40 hours and occurs over poorly-maintained country roads as well at least two different airplanes. The primates are transported in boxes as small as a normal-sized television. This means that the primates have to sit without the possibility of stretching their legs. The transport is extra stressful for the primates because they’ve never been trained for contact with humans and are furthermore forced together with individuals that don’t belong to their social group. The primates are loaded into the airplanes cargo hold by transport and airport personal, and are subjected to extreme variations in both temperature and sound levels once on the aircraft. If the airplane is delayed, the primates can sit for hours without food or water. Once at quarantine in Holland, primates are kept for observation for three months, before being sent off on the last leg of their Hellish journey. Arriving by either truck or plane, the trip from Holland to Stockholm can take up to 17 hours. During these transports the primates sit two-by-two in plastic boxes that measure 50 x 50 x 70 cm. To purchase and transport the primates, SMI has entrusted the Dutch company R.C. Hartelust bv. In 2005, the company transported 50 crab-eating macaques by truck from Holland to SMI in Solna. When the truck arrived, four primates were discovered dead in their cages. They had died of heat exhaustion since the cages had been placed too close to a central heating unit. During the 17 hour long transport, they didn’t have access to water and didn’t have so much as a single apple to eat. They were never checked up on during the trip. Not even Customs checked the transport. It must be assumed that the primates suffered immensely before their deaths along with the several other primates who also suffered from the heat as well as being forced to witness the agonizing death of their four companions. Despite this tragic incident, which was followed up with by a police investigation aimed at RC Hartelust, SMI continues to use the company. SMIs own ethnologist believes that the primates at SMI are put into experimentation too soon on arrival. She refers to studies that show that primates need at least three months to acclimatize to a new environment. At SMI, primates are circulated into vivisection experiments as soon as they arrive. Emilia the ape was one of SMIs oldest research primates. She came from a breeding facility in China and was born in 1995. At SMI she was forced to partake in an experiment where her brain was studied with a surgical camera, to see how it reacted to different substances. Emilia was determined to be very intelligent and very curious by nature. She loved to bathe whenever she was given the opportunity to do so. Another one of her traits was that she always washed all of her food before eating it. Before eating pellets or fruit, she washed her food by rubbing it between her hands. During one of the last inspections conducted by an animal welfare inspector, SMI was criticized for continuing to use her for experimentation even though the veins on her thighs were badly scarred with needle tracks, making further test sampling difficult. Even though several different animal rights groups demanded that Emilia be “retired” to live out the rest of her life at a rehabilitation center, she was killed in 2005. She was 10 years old. At the end of 2007, a primate at SMI suffocated to death after being pinched between a movable wall and the bars that lined the front of his cage. The necropsy showed internal bleeding in the thoracic region. This primate was one of many primates whose death could be attributed to an ”accident” at SMI during the past few years. Three years ago, SMI purchased 50 new primates. When delivered, four were found dead on arrival from asphyxiation in their cages. During 2005, at least one-tenth of the primates at SMI died of causes not directly related to the experiments that they were subjected to. Several primates at SMI have died because of the Institute for Infectious Disease Control’s substandard care for the primates. Two primates died after they received open wounds on their legs, one primate died after being pinched in a cage, another primate died because of dehydration and diarrhea and one primate died from constipation. If the primates had been adequately observed and their welfare attended to, personnel at SMI would have discovered the wounded and dehydrated animals in time to save them. All animal experiments conducted in Sweden must be approved by an ethics committee. They approve about 99% of experiments presented to them and consist of six vivisectors, two jurors, four politicians and two people who are voted in by animal welfare organizations. The ethics committee that makes decisions on primate research at SMI has never denied an application related to the use of primates. It is also important that the decisions made by the ethics committee are adhered to. Based on an inspection protocol from the Swedish Environmental Office in Solna, this is not always the case. During a visit from animal welfare inspectors, such serious violations were found that SMI was given only a few months to improve conditions or else their permits to keep animals would be revoked. So that SMI can use primates as test subjects in animal experiments, primates must be trained on a daily basis to get accustomed to human contact and to learn to cooperate with test sampling. The purpose of training is to reduce the stress of test sampling. During an inspection at the primate unit at SMI two years ago, the animal welfare inspector concluded the following: “What I have seen in regards to the training of primates does not follow the demands that the Department of Agriculture and the Animal Welfare Agency has placed on the Institute for Infectious Disease Control. If SMI, for whatever reason, is not able to follow the demand that all primates must be trained on a daily basis, then SMIs permits, as issued by the Department of Agriculture, must be reevaluated”. Already in 2005, SMI was criticized for failing to train primates on a daily basis; the primates had not been trained for over one month. Despite repeated violations in primate care, SMI is allowed to continue their work. The latest inspection showed that SMI was inadequately keeping medical journals on the primates and that cage cards containing crucial information on what experiments the primates were being subjected to were nowhere to be found - this at a high-risk laboratory where experiments on avian bird flu, mad cow disease, HIV and other infectious diseases are conducted. The primates at SMI are subjected to several different kinds of experiments and in just the last five years, dozens have been conducted. Primates are very expensive research animals, both to buy and to maintain, which means that primates are used in as many experiments as possible. SMI conducts their own experiments on primates, but even other companies like Karolinska hospital, Affibody AB, SBL Vaccin and Söderssjukhuset cooperate with SMI and use primates for research. The majority of experiments conducted on primates concern research on HIV and PET-experiments. Since the 1980s, vivisectors have conducted experiments on primates in a research effort to find a vaccine against HIV. The research has been a dead end since macaques do not develop HIV in the same way as human beings. Around the world, researchers are giving up on using macaques and other primates as test subjects in HIV-research. Because macaques do not develop AIDS, research has focused on a similar virus that primates can contract called SIV. Simian immunodeficiency virus (SIV) is an HIV-like virus found in African primates without causing sickness. But SIV can evolve into an immunodeficiency sickness like AIDS in experimentally infected Asian macaques (for examples rhesus apes and crab-eating macaques). SIV and the human variant, HIV, have been combined by researchers to create a virus called SHIV. But there is a lot that differentiates it from HIV. The primates that are subjected to experiments at SMI are first vaccinated, using different vaccines, before being infected with SHIV. During the course of the experiment, a large amount of blood samples are taken continuously, and many complementary experiments are conducted (for example, to research the toxicity of different parts of the vaccine, or to administer substances that prevent menstruation in female primates). The experiments run for up to two years. Another cruel experiment conducted on primates at SMI since the mid-1980s is an experiment to determine how different substances and chemicals are absorbed by the brain. These brain studies are conducted with the use of a PET-camera. The primates are injected with a tracer chemical which can be followed to see how it is handled by the brain with the help of a PET-camera. The primates are subjected to this experiment a few days a month. A permcath is forced into a leg and this has led to several primates at SMI receiving so much scarring that it then becomes impossible to insert a catheter. The primates are then used in other experiments or killed. SMI even has permits to draw blood from a few dozen primates every year. This continues since 1988. Sometimes so much blood is drawn that they have to be killed. Earlier experiments have focused on BSE (“mad cow disease”) where 12 primates were kept at SMI as a control group for laboratories that were conducting the experiments within the EU. The primates at SMI were then given the same treatment as the other infected primates and several test samples were taken from them, including blood, saliva, spinal fluid, etc. When the infected primates show symptoms of disease, even the control group at SMI will be killed (even though they aren’t infected). Until then, the test sampling will continue. Researchers still do not know if BSE affects primates in the same way as human beings.